Two mountain lion sightings were reported last week in S. Lake Tahoe, near Lake Tahoe Community College. The cat sightings were in the meadow between Black Bart Avenue and Al Tahoe Boulevard. The animals appeared calm and did not exhibit any aggressive behavior, according to the press release from El Dorado County. The County Animal Services division takes the sightings seriously because mountain lions typically avoid populated areas and travel with stealth during the night or at dawn and dusk. One sighting was April 16, at 2:00pm, and the other was April 18, at 4:30pm. 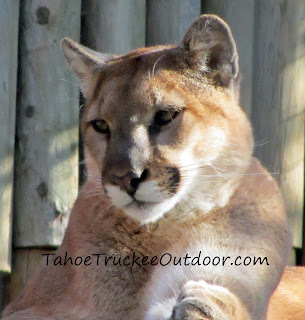 The Lake Tahoe area is mountain lion country, so you should stay aware of your surroundings when traveling in the backcountry. The problem is, mountain lions are sneaky like house cats. They lay in wait to ambush their prey. Mountain lions go where the deer are. Do not hike or bike alone. Avoid hiking or running at night, dawn, or dusk when the cats are most active. Do not leave pets or children alone outside unattended. If you encounter a mountain lion, make noise and try to look big. Never run from a mountain lion. Members of the public in South Lake Tahoe should report routine sightings of non-aggressive mountain lions at: 530-573-7925.